Hi there, this is Dylan and Rebecca -- cofounders of TilesInspired -- here introducing our new blog series, TilesExplained! When we designed our own bathroom in 2016 (before we launched TilesInspired), we encountered a ton of new terms and topics that we struggled to get our heads around. Not least of which were tile specifications. Now, with the benefit of hindsight, as well as all the research we did in launching TilesInspired (you tend to dig pretty deep into products specs when you’re about to pour most of you life savings into inventory), we thought we’d try to pass on what we've learned to anybody who’s trying to sift through all the tile information out there. How much do you know about tile specifications? Glazed porcelain and ceramic tiles are unbelievably durable materials. But between abrasion, stain, slip, chemical, and crazing resistance, there are enough ratings to make your head spin. 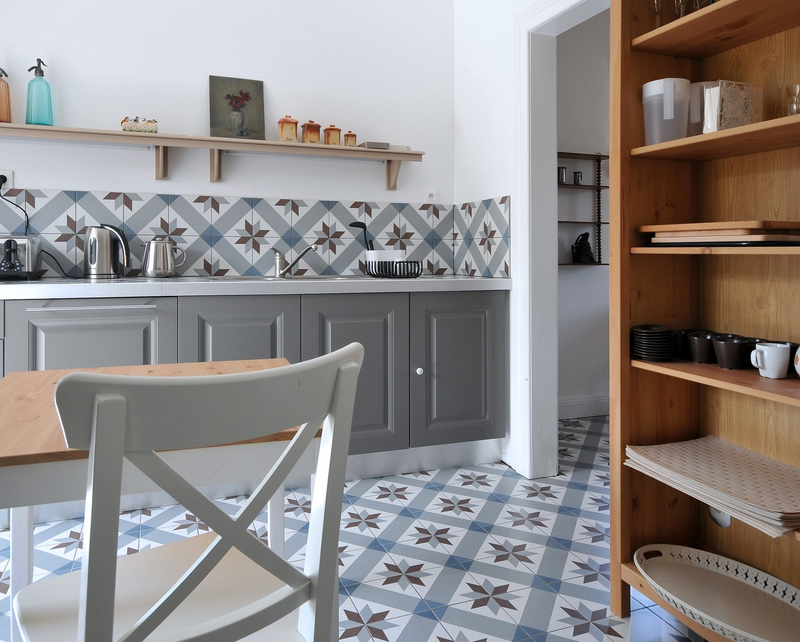 Understanding tile specifications and purchasing the right tile for your intended use is probably the most important way to avoid issues with your tile down the road. The last thing you want after your installation is to find cracks or scratches after just a few uses, have a shiny floor that doubles as an ice rink, or have an uncleanable stain that never fades away. However, getting smart on tile specification can be a challenge, requiring you to read through a lot of often conflicting information and advice. 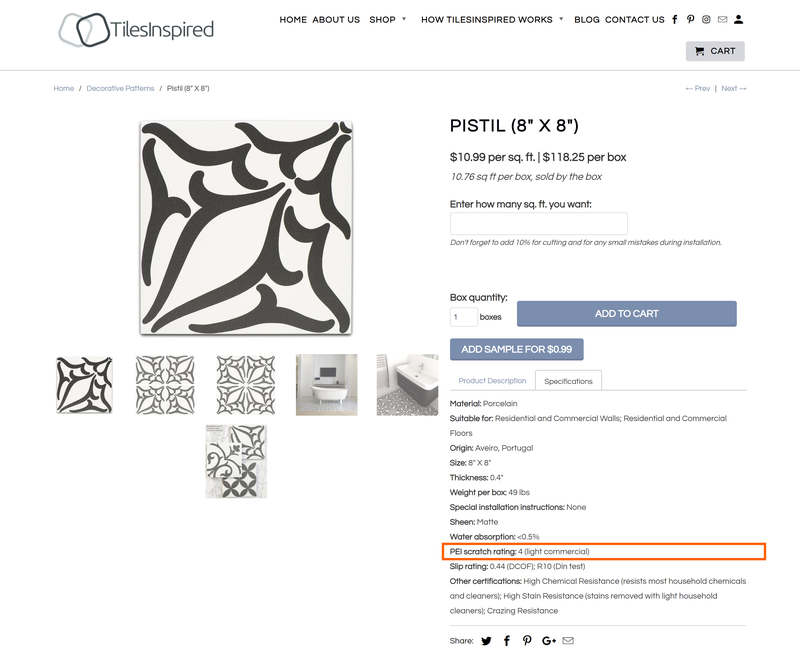 That's why we decided to launch TilesExplained, with the aim of explaining these terms as simply as possible, while still helping you to understand them thoroughly, so that you can confidently push forward with you interior design vision. Without further ado, let's jump into today's topic! What is PEI durability rating? 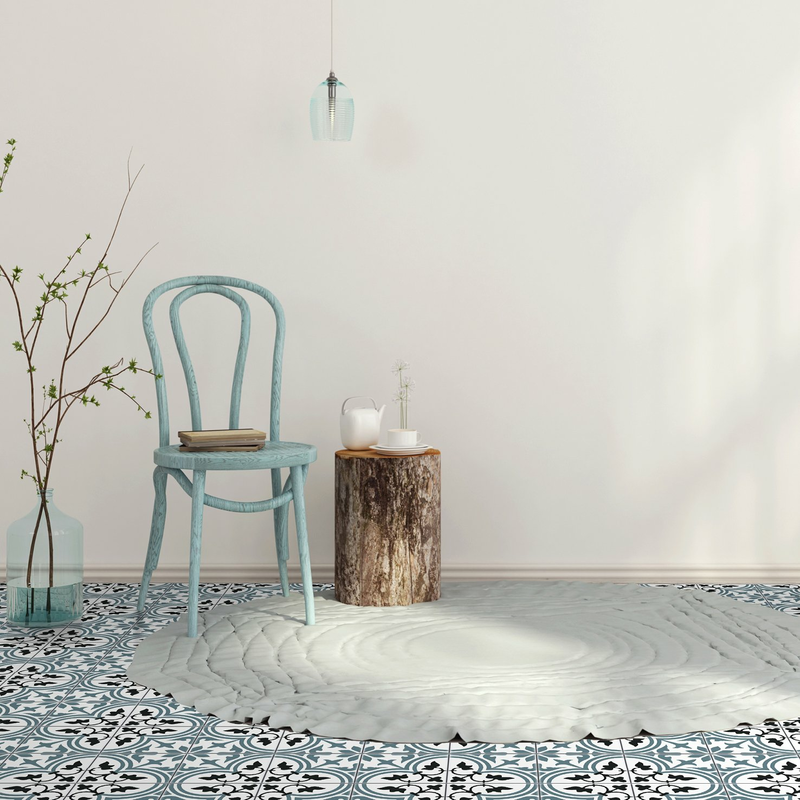 With the advent of digital printing technology for tile in the last decade or so, much of the porcelain and ceramic tile that you see in stores is glazed. This means that there’s a thin layer of glass-like coating applied to the surface of the tile, often for decorative purposes. But not all glazes are the same, and perhaps the most important consideration for you is how resistant to repeated abrasion and traffic that glaze going to be. Will it be durable enough to use in the part of my home or business than I’m planning to use it in? Thankfully, there’s a standardized way that tile manufacturers test and classify the strength of their glazes: the Porcelain Enamel Institute’s abrasion rating, or as you’ll more commonly see, a tile’s PEI rating. The PEI Durability Rating is the industry standard measure that indicates how resistant a glazed tile is to visible marks caused by repeated wear on the tile. This actually takes into account both the strength of the glaze as well as its colour -- you’ll find that deep, dark colours may have lower PEI ratings than lighter colours, even when the tiles use glazes with the same strength. 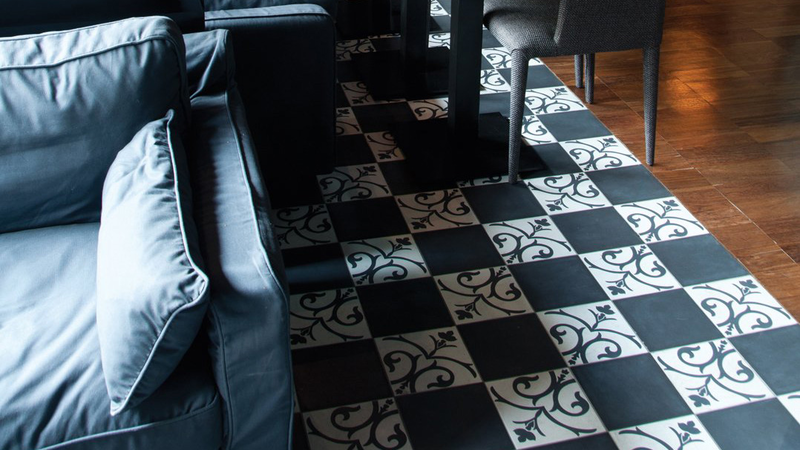 The most important takeaway for you is to make sure that the tile surface will be able to withstand the traffic in the space that you’re planning to install your tile, whether that’s a floor, entry hallway, or even a commercial space like a restaurant. One thing to call out is that you don’t always need to try to buy the tile with the highest PEI rating, just the tile with a high enough rating for your intended use. A lot of beautiful decorative wall tiles are made in a way that results in a more delicate glaze, which is perfectly fine for most walls. How are these tiles rated? All of the tiles assessed for their PEI rating go through rigorous testing that adheres to the International Standards Organization (ISO). 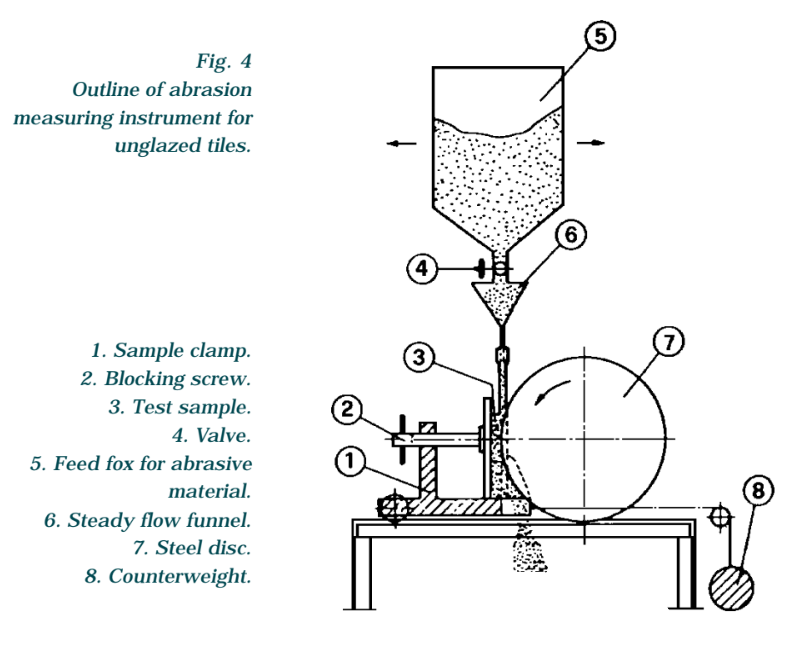 Since the purpose of the rating is to show how resistant the tile will be to long-term wear and tear, the test involves rubbing the tile with an abrasive cloth to simulate foot traffic. The tiles are abrased up to 12,000 times, and then checked to see if they show a visible mark. The more rubbing the tile withstands without showing wear, the higher its rating. PEI Rating 1 Tile has very low resistance to wear, and really should only be used for interior commercial and residential walls. 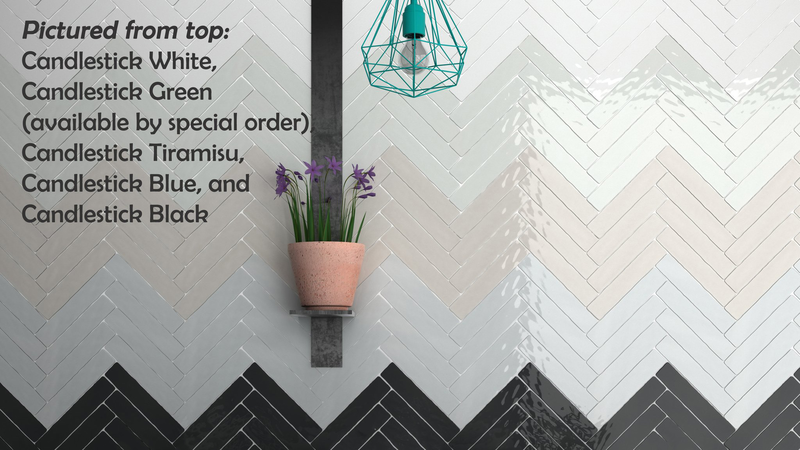 Some wall-specific tiles, such as our Jazz tiles, won't be tested for their PEI rating since they're expected to not encounter foot traffic. Similar to a PEI 1 tile, these unrated tiles should only be used on interior walls. PEI Rating 2 Tiles are used mostly on walls, and can also potentially be installed on floors with extremely light traffic where only bare feet or soft-soled slippers are used. Examples of such areas might be residential bathrooms and bedrooms. Our Candlestick wall tiles have a PEI 2 glaze. PEI Rating 3 Tiles are suitable for all residential floors and walls, such as kitchen floors and backsplashes . The tiles in our Diamond Collection and several of our Decorative Patterns, such as Chex, are PEI 3 rated and perfect for residential use . 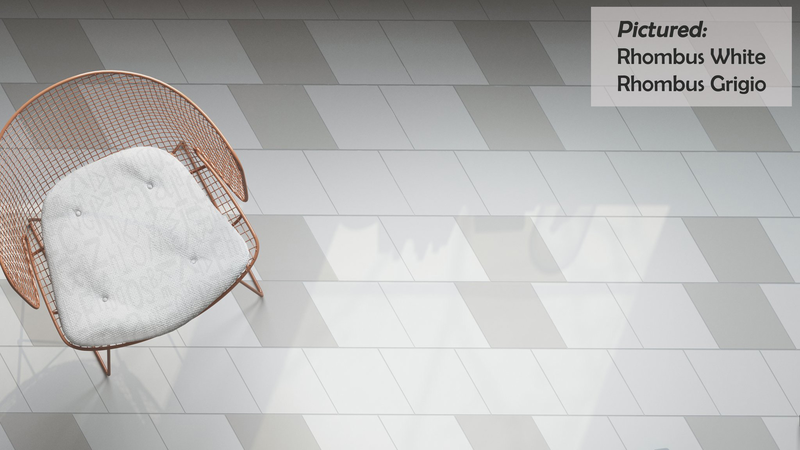 PEI Rating 4 Tiles are durable enough to be not only be installed in residential spaces, but also some light commercial uses, such as retail stores, restaurants, and offices. 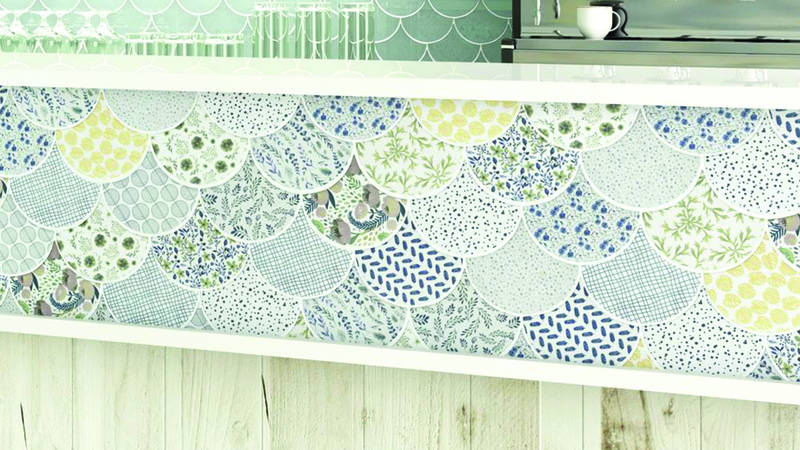 Many of our Decorative Pattern tiles have PEI 4 rating, including Pistil, Revival, Damask, and Hydraulic. PEI Rating 5 Tiles represents the highest PEI score, which means that tiles with such a rating are resistant to visible wear with very high amounts of traffic. 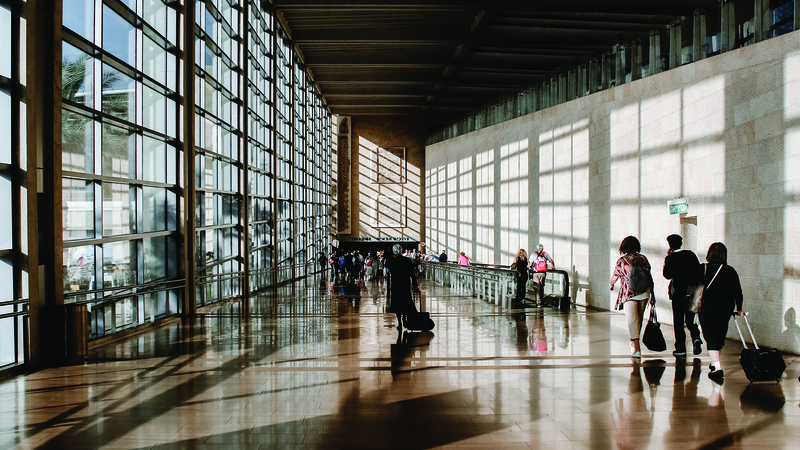 These can be used in heavy commercial areas like Shopping Malls and Airports. Now that I understand PEI durability rating, where do I find this when shopping tiles? Most tile manufacturers list the PEI Rating on the tile’s tear sheet and/or its packaging. If you're visiting a digital store like us here, you can find the PEI durability rating in the specifications tab of any product page. PEI Level 1 This is the least resistant, and is suited for interior walls, both residential and commercial. PEI Level 2 These tiles are also generally best on walls, although for certain products, they can also potentially used for light traffic residential floors. PEI Level 3 These tiles are suitable for any residential floor or wall. PEI Level 4 These are very durable tiles, and can be used in any residential space, as well as light commercial floors. PEI Level 5 This is the highest durability rating that a tile can get, and is appropriate for heavy commercial spaces like airports. 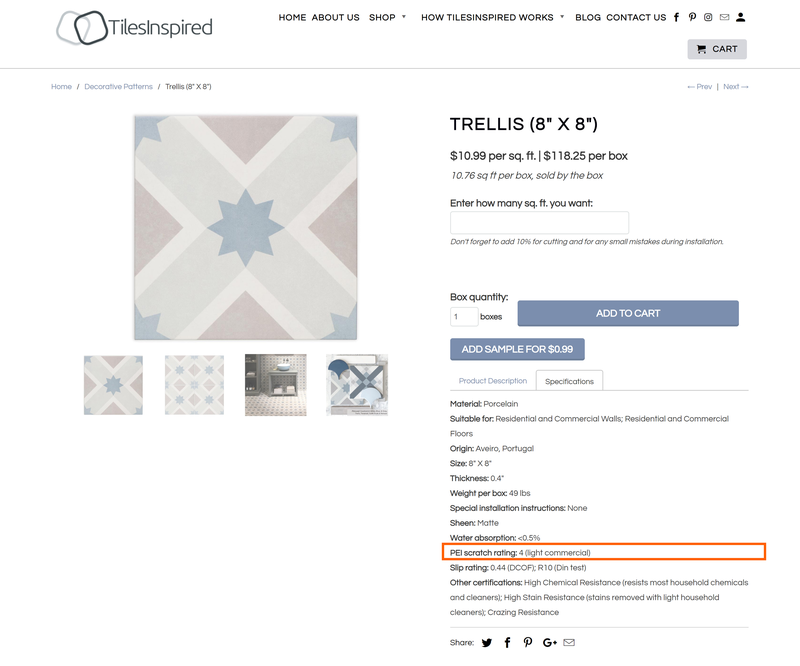 You can find a tile’s PEI durability rating in the "Specification" tab for any of our products in our online store. Hope this has helped you better understand PEI durability ratings and given you confidence that you're choosing the right tile for your space! Our upcoming TilesExplained articles will cover other important tile characteristics like water absorption, stain resistance, and slip resistance. Stay tuned! Ready to pick out the right tile for your space? Leave a comment below and help us make this blog series better for your future reading experience! Really informative summary – thanks!